January 14 – April 9, 2017: Although Shakespeare set The Tempest on a small island off the coast of Italy, many scholars argue that he drew inspiration for the setting, several narrative themes, and the figure of Caliban from the newly encountered Americas. 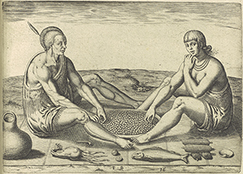 The exhibition will explore this argument by pairing the Rose Library’s Fourth Folio with several engravings from Theodor de Bry’s “Americae” volumes, a series devoted to Columbus’s travels in the Americas, the customs of myriad American inhabitants, and the mistreatment of the native population by Catholic Spaniards. The exhibition will also include several objects from the Carlos Museum’s vast Americas collection, and consider how Shakespeare’s texts may have shaped a specifically English version of colonial contact.